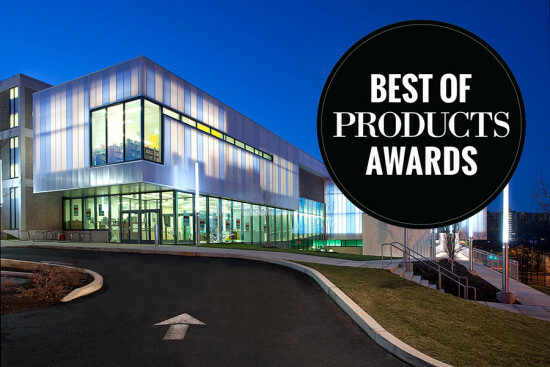 The Architect’s Newspaper first Best Of Products program drew nearly 400 entries, representing all categories of design and construction products. Here is a selection of the finalists from the juried competition. 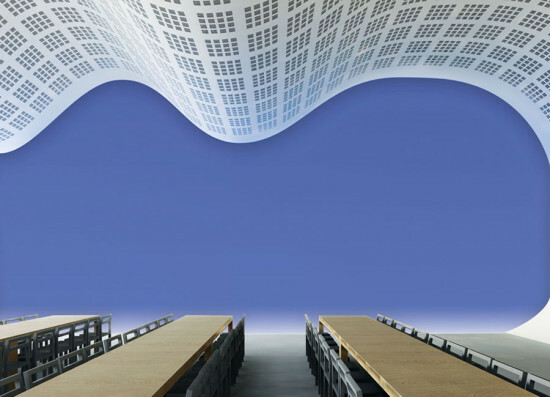 Gyptone BIG Curve CertainTeed Ceilings These perforated acoustical gypsum panels can be formed into highly curved ceilings without the cost and time associated with custom fabrication. At only 6.5 mm thick, Gyptone BIG Curve can be dry-bent to a 10-foot radius, and can achieve up to a 5-foot radius by wet bending. The panels are made of 85 percent recycled content and certified for low-VOC emissions, which contributes to sustainable building standards and helps maintain high indoor air quality. Fitted with an acoustical backing tissue, the panels are available in three perforation patterns. Walkable Photovoltaic Floor Onyx Solar Energy Recently patented, this walkable photovoltaic floor paver supports 400 kilograms/881 pounds in point-load tests, meets anti-slip standards, and reaches efficiency levels comparable to any other photovoltaic building material. It combines passive elements (its installation on a rooftop terrace, for example, improves the structure’s thermal envelope) and active elements (on-site power generation) to greatly reduce a building's environmental impact while avoiding CO2 emissions. Equally important is the appealing design of the system. It offers a wide range of colors, sizes, and transparency; it can be modified to accommodate LED backlighting. VOLA Round Series Hand Shower Hastings Tile & Bath The Round Series hand shower takes the core elements of the VOLA design language—the circle and the cylinder—as the starting point to create an entirely new product. Subtle polymer details on the handle helps users keep a grip on the fitting. Available in polished chrome, brushed chrome, natural brass, brushed stainless, and a range of colors. Designed by Aarhus Arkitekterne. LN Series Cree The wing-like design of this sleek luminaire allows a more uniform illumination of task surfaces and ceilings, while providing exceptional efficacy of up to 110 lumens per watt. The series is modular in nature, with four-foot light engines that can be easily combined for longer runs. 2C Window Weco Windows S.L. Developed by a team of Spanish architects, this re-envisioning of the traditional wood window features a sash that combines glass and hardware in a single assembly, without a frame. The self-supporting glass becomes a sheer, transparent plane, maximizing light and transparency. Wall openings are framed in wood, the glazing fitting hermetically over the frame using advanced technology in hardware and sealants. Triple gaskets assure maximum thermal and acoustical performance. The double- or triple-glazed window is available in fixed, tilt-and-turn, sliding, and hinged versions. The sliding window allows unbroken openings up to 19 ½ feet long. The interior face of the unit is finished in baked enamel in black, white, or any RAL color. P3 Comforts Duravit The P3 Comforts suite of bathroom fixtures uses a design language of simple geometry and subtle shifts in planes to create an aesthetically calming experience. The washbasin features a raised tap platform, separate from the wet area, making a generous shelf surface for bathroom essentials. The shower tray has an easy-clean outlet that is seamlessly integrated into the raised base, emphasizing its pristine lines. The tray was created with a new material, DuraSolid, which provides Class B slip-resistance without additional coating. Designed by Phoenix Design. On a hot day in June, a jury convened to review nearly 400 entries to The Architect’s Newspaper first Best of Products competition. Submissions, divided over eight categories, abounded in new materials and exciting technologies, provoking a lively dialogue during the evaluation process. Colin Brice of Mapos, Barry Goralnick of Barry Goralnick Architects, Harshad Pillai of Fogarty Finger Architecture, and architect Alison Spear generously contributed their considerable expertise and insight to the judging. While the complete roster of winners can be found in our just-published print edition, AN will be publishing the results daily over the next week. The entries in today’s categories, Facades + Structural and Openings, show a joint interest in streamlining the installation process while expanding aesthetic possibilities. View all of the published categories here. FACADES + STRUCTURAL “Good technology, exciting optics.” —Barry Goralnick Winner UniQuad Unitized Daylighting System CPI Daylighting The UniQuad system is a unitized assembly of two independent, translucent, insulated panels, joined by a mechanically interlocking structural connection that eliminates the need for vulnerable adhesives. Factory pre-fabricated for efficient installation, the panels’ long-span capability (up to twelve feet) allows them to be clicked into place on site, providing a seamless, flush look without metal seams. UniQuad features Removable Skin Technology (RST), which protects the interior panel from exterior weather conditions, UV radiation, impact and other hazards and provides indefinite building envelope protection. RST allows the replacement of the exterior skin while keeping the interior skin sealed and intact. As a result, building operations are uninterrupted during exterior panel replacement. Honorable Mention Metal Composite Wall Panels Kovabond Kovabond is a metal composite material designed to provide extensive design options for exterior cladding and wall panels. Kovabond consists of two outer skins, available in aluminum, zinc, copper, and stainless steel, that surround a solid core of low-density, fire-retarding, polyethylene compound. Available in a broad palette of colors, the lightweight panels are highly bendable, yet retain their rigidity and strength. Honorable Mention Glass Fiber Reinforced Concrete Panel seele A tour de force of design and fabrication, this glass fiber reinforced concrete panel is attached to a back-up steel frame that allows for installation. With a section view slightly resembling an upside-down letter "L", the soffit panel gently curves inward. The abnormally long leg of the "L" shape is a parallelogram with a bowl-shaped depression on the surface. It’s one of 2,500 panels made from 313 different molds that will wrap the Broad Museum in Los Angeles. OPENINGS Winner 2C Window Weco Windows S.L. Developed by a team of Spanish architects, this re-envisioning of the traditional wood window features a sash that combines glass and hardware in a single assembly, without a frame. The self-supporting glass becomes a sheer, transparent plane, maximizing light and transparency. Wall openings are framed in wood, the glazing fitting hermetically over the frame using advanced technology in hardware and sealants. Triple gaskets assure maximum thermal and acoustical performance. The double- or triple-glazed window is available in fixed, tilt-and-turn, sliding, and hinged versions. The sliding window allows unbroken openings up to 19 ½ feet long. The interior face of the unit is finished in baked enamel in black, white, or any RAL color. “Up to a 48-foot opening: That presents outstanding options.” —Colin Brice Honorable Mention JELD-WEN Custom Wood Folding Window JELD-WEN Windows & Doors A novel solution for residential or light commercial projects, this accordion-folding window assembly folds off to the side of the opening to connect the kitchen—or any room—to a backyard, deck, or patio at counter height. The system, with up to eight panels, is available as a top-hung application and can be designed as either a flush sill that smoothly meets the stretch of counter or as a standard outswing sill. The maximum opening width is 48 feet, achieved by combining two 24-foot installations. Available in multiple configurations, the folding window is offered in 42 exterior paint finishes, three copper panel options, and a variety of wood species. Honorable Mention Entice Series Premium Entrance System CRL-U.S. Aluminum While this system retains the elegant appearance of a frameless glass entrance with minimal vertical lines, it has the strength to support door handle hardware on one-inch-thick insulating glass panels. Designed for use with all high solar- and thermal-efficient glass options, including low-E coatings and tints, Entice delivers contemporary heavy-glass storefront aesthetics while satisfying energy code requirements and ASHRAE 90.1 air infiltration criteria. Patent-pending vertical stiles with ultra narrow sightlines and door rails feature thermally broken cladding that provides U-factors as low as 0.33. In addition, configurations with prewired LED lighting systems provide commercial environments with striking accent lighting that enhances the function and appearance of the facade.